Get here the NCERT Exemplar Problems and Solutions for CBSE class 10 Mathematics chapter 9- Circles (Part-IVA). This part consists of Long Answer Type Questions. Here you will get solutions to question number 1 to 7 form exercise 9.4 of NCERT Exemplar for Mathematics chapter 9. 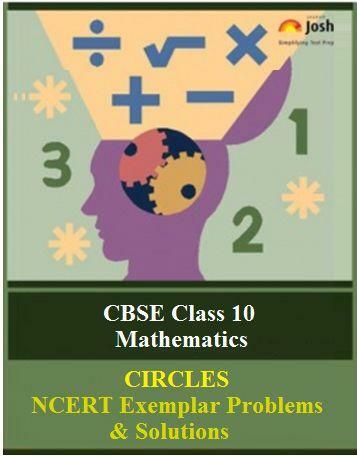 Here you get the CBSE Class 10 Mathematics chapter 9, Circles: NCERT Exemplar Problems and Solutions (Part-IVA). This part of the chapter includes solutions to Question Number 1 to 7 from Exercise 9.4 of NCERT Exemplar Problems for Class 10 Mathematics Chapter: Circles. This exercise comprises only the Long Answer Type Questions framed from various important topics in the chapter. Each question is provided with a detailed solution. Given: A hexagon ABCDEF circumscribes a circle such that the sides, AB, BC, CD, DE and DF touches the circle at P, Q, R, S, T and U respectively. Question. 2 Let s denotes the semi-perimeter of a ΔABC in which BC = a, CA = b and AB = c. If a circle touches the sides BC, CA, AB at D, E, F respectively, prove that BD = s - b. A circle is inscribed in the ΔABC, which touches BC, CA and AB at D, E and F respectively. Also BC = a, CA = b and AB = c.
Question. 3 From an external point P, two tangents, PA and PB are drawn to a circle with centre O. At one point E on the circle tangent is drawn which intersects PA and PB at C and D, respectively. If PA = 10 cm, find the perimeter of the triangle PCD. Given: PA and PB are two tangents drawn to a circle with centre O. A tangent CD at E, intersects AP and PB at C and D respectively. Question. 4 If AB is a chord of a circle with centre O, AOC is a diameter and AT is the tangent at A as shown in figure. Prove that ∠BAT = ∠ACB. Given: Chord AB, diameter AOC and tangents AT of a circle with centre O. Here AC is a diameter and we know that diameter of a circle always subtends a right angle at any point on the circle. Question. 5 Two circles with centres O and O’ of radii 3 cm and 4 cm, respectively intersect at two points P and Q, such that OP and O’P are tangents to the two circles. Find the length of the common chord PQ. Two circles with centres O and O’, and radii 3 cm and 4 cm respectively are drawn to intersect each other at points P and Q. OP and PO’ are two tangents drawn at point P.
Join OO’ such that it intersects PQ at R.
Now, as the perpendicular drawn from the centre bisects the chord. hypotenuse AC at P. Prove that the tangent to the circle at P bisects BC. parallel to the tangent PQ. Find the ∠RQS. Given, PQ and PR are tangents from an external point P to circle.